In 1822, Gov. Lewis Cass defined the boundaries of six counties, including Lenawee. The Pottawattamies inhabited Lenawee County before settlers, many of Quaker descent, migrated from eastern states, predominantly New York. Abundant forests, prairies, hills, lakes, and streams surrounded by uncultivated fruit, berries, nuts, and wild game had enabled the county to lead the state in agricultural and industrial wealth by 1900. This early success is also partially owed to the establishment of the Grange by George B. Horton in 1873. 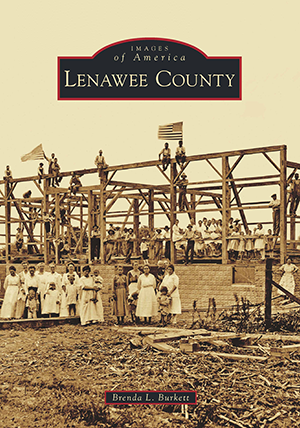 Lenawee led the state with 34 Granges and more than 3,500 members by the turn of the century. Adrian would become known as the fence capital of the world, while Tecumseh was referred to as the celery capital. Michigan's first cheese factories began in Fairfield Township in 1866, with Samuel Horton creating a new form of soft cheese. Recognition of the historical significance of this area is shown throughout the region today with landmarks that pay tribute to the pioneers. As a graduate of Eastern Michigan University with a bachelor's degree in historic preservation, Brenda L. Burkett has always held a special interest in the history of pioneer settlements and community development. She is a zoning administrator with a focus on community revitalization. Burkett has gathered images from the Lenawee County Historical Museum.